On-street electric transit has many environmental advantages over the internal combustion engine, but is expensive to implement. 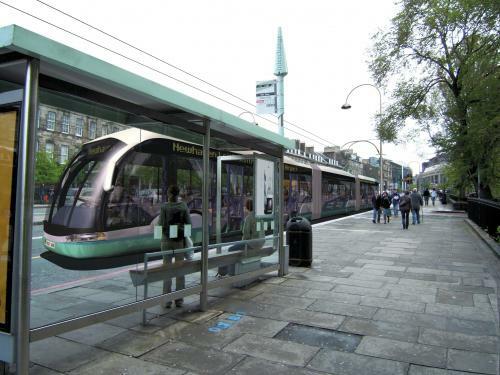 The aim of this site is to promote on-street electric transit in Scotland by raising awareness of a prestigious, proven, affordable mode of transport: the modern trolleybus. This Scotsman article gives a brief introduction to trolleybuses. The briefing below (also available as a PDF file) has more information. Currently the main alternatives considered for urban mass passenger transit in Scotland are buses, heavy rail, and trams. The aim of this briefing is to provide information about another tried-and-tested mode of public transport: modern trolleybuses. The trolleybus (variously known as ‘trolley-coach’, ‘tbus’, ‘electroliner’, ‘street car’, or ‘trackless tram’) is a bus that is powered by electricity from two overhead wires - though it could also be viewed as a tram with rubber tyres instead of metal wheels and track. The modern trolleybus offers a prestigious, affordable mode of transport which, in a well designed scheme, will have a ‘more than the sum of its parts' reward in terms of passenger numbers, passenger satisfaction and thus profitability. Standard trolleybuses can move round obstacles such as parked cars, or even run off the wires for short distances using auxiliary battery power supplies. Modern dual mode trolleybuses can be just as flexible as buses, running without wires, in historic city centres or if there are diversions from the wired routes. Thus, only parts of routes need to be electrified, and the trolleybuses can operate in battery (or biofuel) mode at the centre of the routes, as happens in Rome and Beijing. Trolleybuses tend to have lower capacity than trams, although there are double articulated trolleybuses with a capacity of 200 passengers. Trolleybuses and trams can coexist on the same routes in the same city, although this requires there to be three overhead wires (two for trolleybuses and one for trams). Modern trolleybuses can be 100% low floor and achieve the same docking precision as trams, by using kerb guidance. The relative merits of buses, trolleybuses and trams will depend on the details of each scheme. However the table below gives each mode of transport an indicative star rating (★★★ is best, ★ is worst). Based on table in New Concepts for Trolleybuses in Sweden, Swedish Transport and Communications Research Board, 2000. 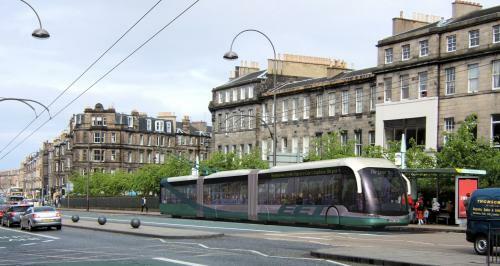 Modern trolleybuses were not considered in the STAG benefit:cost analysis of the Edinburgh tram scheme. Given the similarity of the electrical infrastructure for trams and trolleybuses, it might be possible to use some of the work done so far by TIE for a trolleybus scheme, should the tram scheme fail. Recently trolleybuses guided by a centre rail have been developed. However, unless there very special requirements, they are expensive, and have not yet been proven in long-term service. Hydrogen powered vehicles are currently impracticable because of their low efficiency and high weight. This briefing was written David Sterratt, with assistance from members of the Electric Tbus Group.